Home BLOGS Helo celebrates Valentine’s Day with Gully Boy stars. Helo celebrates Valentine’s Day with Gully Boy stars. 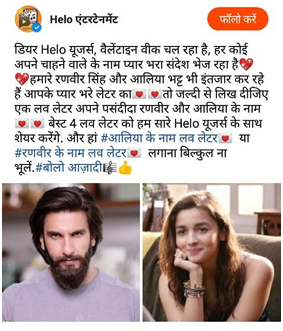 This Valentine’s Day, users of Helo, India’s leading regional social media platform, will get a chance to celebrate with the stars of one of the most awaited Bollywood movies of the year, Gully Boy, which is slated for release on 14th February. Through a partnership with Excel Entertainment, Helo has launched a seasonal campaign giving app users a chance to engage with Gully Boy stars Ranveer Singh and Alia Bhatt on the app. To further celebrate with the stars, Helo users are also being encouraged to share their dreams and write love letters. To officially kick-off the campaign, Helo has shared videos of Ranveer Singh and Alia Bhatt appealing to their fans to install the app and follow handle of Excel Entertainment in the app, as well as go watch the movie. These two posts have more than 100,000 views and @Excelmovies has got about 60,000 likes, already. Mr. Barooah adds that in line with the theme from the film, Helo is also running a campaign called #अपना टाइम अपुन लाएगा (I shall make my dream come true), where Helo users can share their dreams which they want to be fulfilled. Gully Boy is a film about a 22-year-old boy Murad from a ghetto in Mumbai, who realizes his calling to be a rapper. The movie documents Murad ultimately realizing his love for rap and his dream to become the best at the art and rise out of his social status.